Christmas is the season for creating a warm and welcoming atmosphere for your home that belies the wintry weather outside. One of the best ways to achieve this is to have bright golden and warm yellow lights decorating your indoors and out. Christmas lights decoration can bring a festive look as well as a cozy glow to your home. They create a holiday ambiance and bring in the holiday spirit. A nice display of colorful, sparkling, and twinkling lights create a festive look for your Christmas decor. Christmas lights decoration has almost become a tradition during Christmas. Putting up a Christmas lights display is a great way of spending time with your family and friends or enjoying some creative time for yourself. Christmas lights are almost a staple when it comes to Christmas decorations. Adding lights to any decoration adds interest to the decor and makes it shine. They help you showcase the best features of your home. It also helps you highlight the details you love most. Also, it has a uniquely bright and festive look. Decorating the outdoors with Christmas lights can certainly help in adding interest to the roof line, walkways, front doors, etc. of any home. Electric string or fairy lights can add a romantic and warm mood to our home and create a magical scene for Christmas! We have gathered some really interesting and inspiring Christmas lights decoration ideas for you. Whether lighting up your Christmas display or planning to outline the roof of your home, these lighting ideas can help you illuminate your home in festive style. This beautiful pre-lit Christmas tree looks immensely festive despite its simple decor. The simple decoration of golden string lights gives the tree a warm glow and a welcoming look. It also helps show off the natural beauty of the tree. The lack of any other elaborate decoration further adds to the festive look of the lit up tree. This mantel decor shines brightly despite its simple setting. The rustic on the mantel wall has a decoration of white string lights which gives it a festive touch. The small Christmas trees with LED light decorations further add to the festive look of the atmosphere. They bring in the holiday spirit and lift the mood of the entire room. If you’re looking for a minimalist design or if you don’t have enough space for a Christmas tree, plastic trees aren’t the only option for you. Try something different this year with an alternative wall tree. All you need to do is mark an outline of the tree and then attach the string lights to it. This idea is inexpensive, creative, and very elegant. It saves a lot of space as well allowing you to enjoy a traditionally festive Christmas without compromising on space or money. It’s not just the halls and bedrooms that need sprucing up for Christmas. The small lobby or corridor in your apartment can also sport a nice welcome to the coming holidays with Christmas lights decoration. Hanging star lanterns and string lights give the small space a festive look. It brings warmth and light to the dark and cold nights and makes for a great welcome for the guests. If you don’t use your fireplace hearth quite often, you can still utilize the space for a creative and bright Christmas lights decoration. These glass jars filled with sparkling fairy lights give a whimsical appeal to your fireplace. They bring a warm glow and also add a festive touch to the room decorations. You can even try these glass jar decorations at any place in your home to add that extra sparkle to your Christmas decorations. Decking your front yard or gardens with these oversized lighted wire balls will certainly make for a picturesque Christmas display! These colorful and sparkling light balls add color and glow to your outdoors. They bring a vibrancy to the decoration. Admittedly a little elaborate, they still look very festive and add a touch of whimsy to your decorations. This snowman wreath in purple details looks even more beautiful with the Christmas lights decoration. All you need is two grapevine wreaths, some greenery, faux purple flowers, purple snowflake ornaments, white faux magnolia flowers, the letter ‘M’, and purple ribbon. Decorate the wreaths as you want and add the black hat on top. Wrap the wreaths in string lights for that added sparkle. This LED fairy dust balls are a cool way to add a whimsical touch to your gardens. Although these hanging lanterns look good all year round, they do have a great effect on your garden decor during Christmas. Instead of going for your regular garden stakes or string lights, try to shake things up a bit this season! Add a magical touch to your garden with these LED fairy dust balls. A comfortable armchair, a cozy throw, a lit up Christmas tree and twinkling fairy lights. Sounds like the perfect Christmas setting doesn’t it? 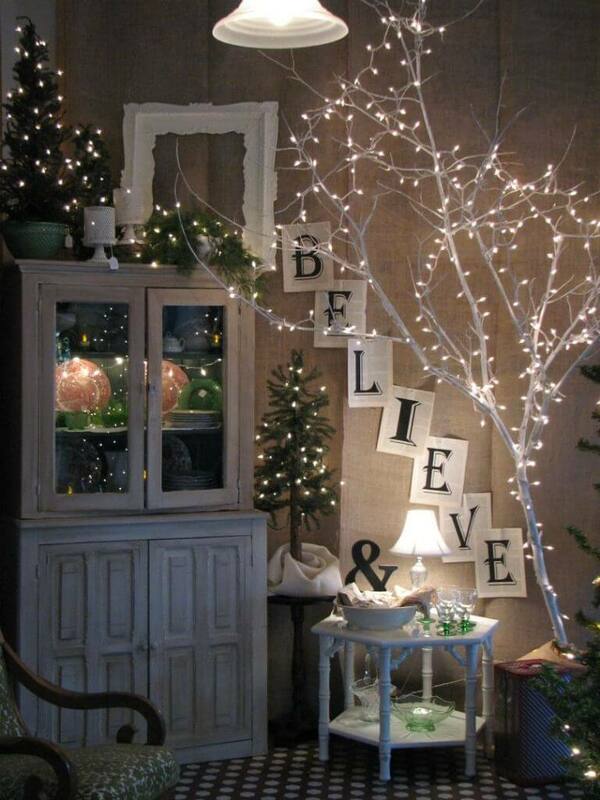 This cozy living room decorated warmly for Christmas does look like a dream setting. The beautifully decorated tree looks even more beautiful with these twinkling fairy lights. The pre-lit Christmas gift silhouette also adds to the magical look of the room. A garland decorated with fairy lights and globe lights adorns the ceiling. All in all, this Christmas living room is a perfect example of elegant and warm lights decoration. This Christmas lights decoration is a little unusual. Christmas trees lit with string lights adorn the cupboard as well as a stool beside the cupboard. A dried up tree, wrapped in string lights also sits near the coffee table. Christmas letters decorate the adjacent wall and bring in the holiday spirit. Candles and greenery adorn the cupboard beside the tree. The glow of the lights gives a warm and cozy atmosphere to the decorations. This decor is a little different but no less festive or beautiful. Decorating your outdoors also includes decorating the driveway or walkway before your home. Instead of going for regular lights or lamps, you can try these spiral pathfinders. These multicolored Christmas tree pathfinder lights look so beautiful lighting up the night. Not only do they light up the walkways for your guests, but also give a festive touch to your outdoor decorations. Plus, their various colors will cast a nice multihued glow on your outdoors! Why limit the Christmas decorations to our homes and churches? This beautifully lit Christmas tree brings fun and festivities to the entire street! Decorated with shining Christmas ornaments and sparkling Christmas lights, this Christmas tree is the perfect example of a grand Christmas lights decoration. Lanterns have a long-standing history as an intrinsic part of Christmas decorations. They bring light, warmth and a traditional touch to any decoration. Decorating your house with lanterns brings light and hope into your home. Decorating your outdoors like porch or yard with lanterns is also a popular practice during Christmas. It can light up your porch and dispel the darkness and gloom of the night. It also gives your decor that extra festive look. Add in some Christmas trees wrapped in fairy lights to bring some holiday cheer to the decor! This craftily decorated terrace is certainly a refreshing retreat from the hustle and bustle of our daily life. This fully illuminated terrace looks like a scene from a fantasy book. A ceiling made of golden string lights giving a glimpse of the open sky look stunning. The side walls are draped with string lights. Fairy lights adorn the various plants. Lanterns filled with pre-lit candles and fairy lights illuminate the floor. A plush seating arrangement is highlighted skillfully with a glowing centerpiece on the coffee table. Pre-lit spiral golden Christmas trees with star tree toppers set the mood for the holidays! This decor is festive, bright and very cheerful. A whimsical front yard with a different decoration is a great way to impress your visitors and stand out among the neighbors. 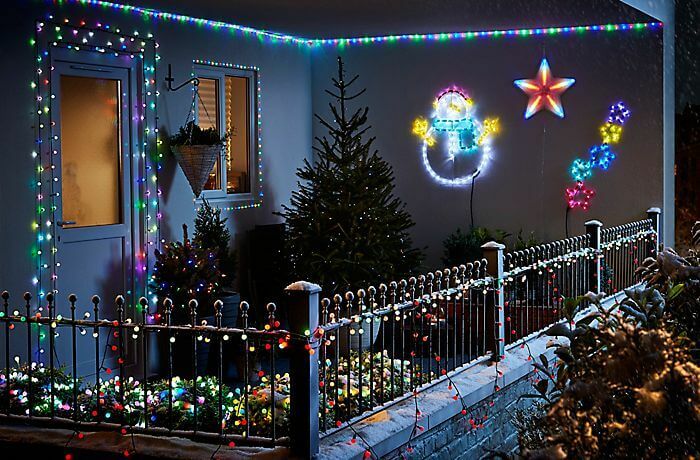 Elaborate Christmas lights decoration for the front yard is a tried and tested method. Sure it will always look good, but why not shake things up a little this season? You can try this whimsical decor of children’s cartoons and add some fun to your yard decorations. Prelit cartoon cutouts and white tinsel Christmas trees decorated with blue globe lights add a touch of fantasy to the decoration. They certainly stand out and bring some extra cheer to your Christmas yard decoration. These DIY twine spheres can add light and warmth to any decoration. They bring in a certain rustic charm and natural appeal to the decor. These DIY spheres are also very easy to make as shown in the tutorial here. Made of twine and string lights, these spheres look great in any type of decoration, especially a coastal or beach-style decor. These small pre-lit Christmas trees adorning the front door look so adorable! Even without any other elaborate front door decorations, this simple decor manages to look festive and elegant. The golden planter and golden fairy lights give the decor a festive look. Placing a Christmas tree on the front door is an old practice in many parts of the world. This beautifully simple decor brings holiday cheer and Christmas spirit to the front porch and outdoors. Decorating your backyard with Christmas is a tried and tested option. Although it looks good no matter what! However, you can try going for the alternative tinsel Christmas trees this year. They are easier to maintain and store and also reusable. Just drape them with multi-colored Christmas lights and put them in your backyard. Simple efficient, and effective Christmas backyard decoration in minutes (okay maybe more but still!). Fairy Lights Jars are a popular Christmas DIY project as they are so easy to make. Just follow the instructions given here and make your own fairy lights jars. Besides being easy DIY, these jars are also very pretty and elegant for decorations. To use them as Christmas centerpiece, just place them in a tray and add a green garland and some pinecones around them. This gives a rustic and warm Christmas look and is a classic Christmas lights decoration idea. These Outdoor Nativity Scene rope lights silhouettes are a popular yard decoration option. Nativity scenes are quite common in Christmas decorations. They evoke the real spirit of Christmas, originally intended as a celebration of the birth of Jesus. Not only that, but they also bring in the holiday spirit and further enhance the festive and auspicious atmosphere of Christmas. This particular nativity scene is in the form of rope lights silhouettes. It is a creative and festive way of using Christmas lights in your decorations. What a novel idea to make a chandelier out of string lights! This beautiful chandelier looks so pretty and festive. The warm glow of the golden lights gives the decor a festive touch. To get this look all you need is a chandelier base and some golden string lights. Just wrap the lights around the chandelier and take care to let the lights fall down as in the image. Then hang the chandelier in your living room or dining table and see it glow! The hanging lights look beautiful. If you want a look of falling snow or icicles, you can replace the golden lights with white accent lights. This lighted burlap garland looks very beautiful and has a rustic country charm to it. It is also very easy to make your self. All you need is some burlap ribbons and string lights. Just follow the instructions of this tutorial and you will have yourself a beautiful burlap garland. You can also use it for mantel decorations or as a garland decor for any place really. It gives a rustic look and brings warmth and comfort to any decoration. This beautiful Christmas front door decor looks like a winter wonderland decor. All you need to recreate this look is white accented string lights. Lots of them too. Drape these lights on the front door frame like a thick garland and wrap it on the porch step railings. Also, put two white tinsel Christmas trees near the front door and wrap it in Christmas lights too. That’s all you need to do to get this beautifully lit front porch decoration. Christmas stars are an important part of any Christmas decoration. They have a traditional significance in Christmas decorations. Same is also true for Christmas lights. This star lights decoration is both traditional and modern at the same time. These pre-lit star lights look like twinkling stars decorating your window. They bring in light and warmth and also bring in the festive spirit. This particular balcony display looks so vibrant and beautiful. Multi-colored Christmas lights decorate the walls and door of the balcony. Similarly, multi-colored fairy lights are draped on the small plants and mini Christmas trees in the balcony. Also, one of the walls is adorned with pre-lit rope light snowman, lighted star of Bethlehem, and other star decorations. This creative memory wall is a great Christmas lights decoration idea. All you need is some string lights or fairy lights. Firstly, hang them from the nails on your walls as shown in the image. Now you can also use them to display your old photos or cherished memories. Just clip them on the light string with a clip. The lights will light up the pictures giving you your very own nostalgic memory wall. It is also a great way to use Christmas lights for your bedroom decoration. Previous article30 Short Bob Haircuts – Flaunt Your Short Hair, Surprise Everyone!